Replacing Head Box S, the low-noise components of the S2 suit demanding headphones, includes 6.35 and 3.5mm outputs. The new S2 casing is a big asset to the design, as not only does it deliver the highest visual appeal, but it is also sturdy enough thanks to being fully made of aluminium, to protect the internal circuitry against unwanted interferences and vibrations, which can cause unpleasant listening experiences. Head Box S2 has enough power to unleash highest sound quality from any headphone. It features one RCA input for a source of your choice. Front-sided are two headphone jacks, one 1/4 inch for hifi headphones and one 1/8 inch for modern head– and earphones. For shared listening experiences both outputs can be used simultaneously. The 725 mW output power will deliver top quality sound and enough volume, even for those who wish to listen at loud volumes! Head Box S2 features a rich and full sound with plenty of dynamics and transparency. Only the best possible components were used to create this unique headphone amplifier. 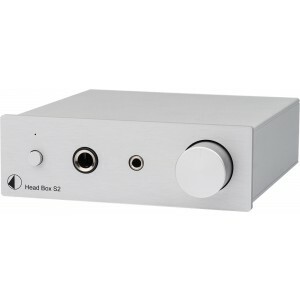 Due to its low price combined with versatility, power and high quality, the Head Box S2 is a true audiophile bargain!